TJ Formal Dress Blog: Biggest In Store Sale Ever! Biggest In Store Sale Ever! Our biggest sale ever is on now! Every single item in store is on sale - really - every single thing! If you have a formal event coming up in the near future (or maybe you're just hoping for one), now is the time to go shopping and get a great deal. It's fun, so you might as well take a look around! Thousands of prom, bridal, mothers, girls, pageant and social dresses are 10% - 75% off. Hundreds of shoes start at $9.99. Jewelry, accessories and other finishing touches are discounted. prom dresses • bridal gowns • mothers and social occasion wear • girls dresses • pageant gowns • cocktail dresses • bridesmaid dresses • shoes • jewelry • handbags • veils and headpieces • slips • lingerie shawls • accessories • garters • Foot Petals • Spanx • Hollywood Secrets and more! 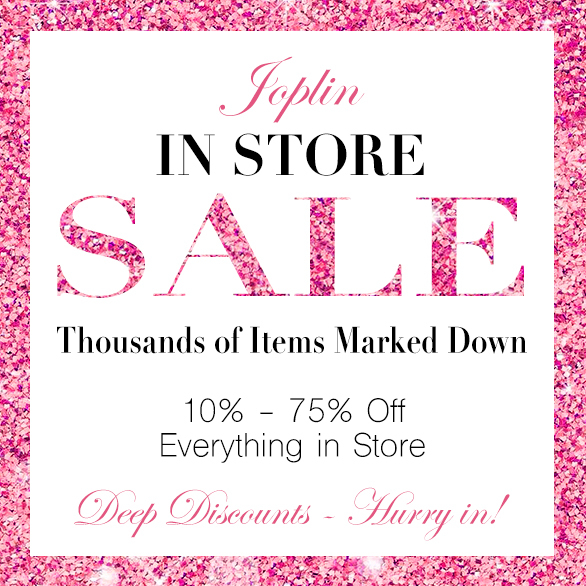 Sale is for in stock items only while they last - hurry in for best selection! Come see us today at 508 N Range Line Rd in Joplin, Missouri.